Candy greatness doesn't require an oven! 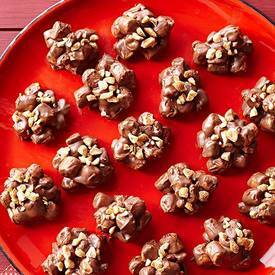 Our chocolate-peanut-marshmallow clusters prove that a no-bake treat is the perfect choice when you're short on time (and they're yummy, too). When I make these for parties or gifts, I temper my chocolate first! It just makes everything more appetizing and pretty!